CLASSES From $25.00 Plus materials for minimum of 2hrs. Classes are currently all Book your own which means choose a class that you are interested in from those listed and then contact me at info@serendipitybeads.co.nz to book a suitable time. A knowlege of Tubular or Flat Peyote helps for this pattern although it is sitll relatively simple to learn as a beginner also. Using the smallest beads these make perfect buttons to match your bracelet or necklace project. Join several together to make a bracelet, can be made into earrings, or used as a pendant with the larger sized beads. You will want to make many. A Materials list will be emailed or given to you on receipt of booking and payment! 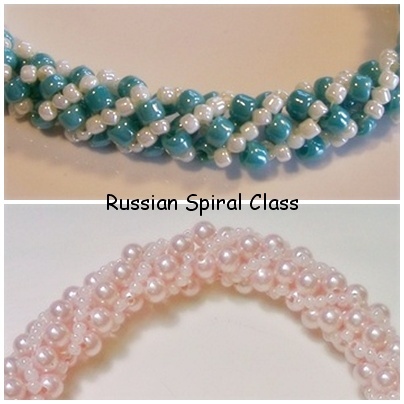 Please email me at info@serendipitybeads.co.nz to book a suitable time for your class. Thank you. This is a very easy form of netting using Japanese Seed Beads in sizes 6 (or 4mm Swarovski Pearls), 11 and 15. Netting stitch works up very quickly which is great if you are short on time. Peyote stitch is a great first stitch to learn and is fast to make up. It is a bit like weaving an opens up a whole new world in beading. Thee are two forms - tubular and flat. Twisted Herringbone (Ndebele) is as it suggests a spiral version of basic Herringbone stitch. It is not a prerequisite to have learned the basic version before this one, and is simple to learn and relatively quick to make up. Changing the colours you use can change the look of this pattern quite considerably.